Cheers to a unique, yet classically designed wedding favor. 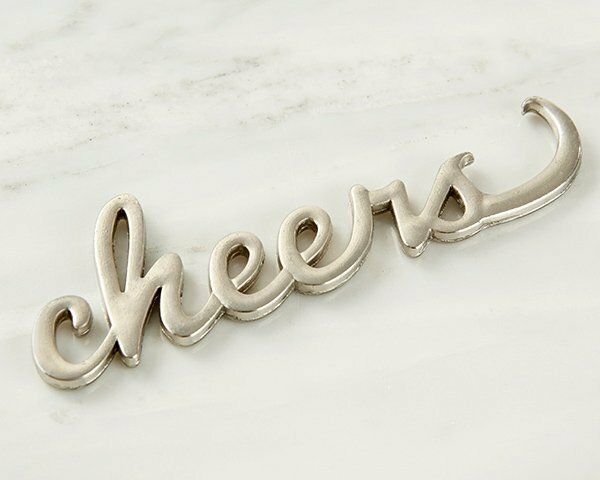 Kate Aspen's Cheers Silver Bottle Opener features "Cheers" written in script with the "s" doubling as the bottle opener design. Made of sturdy metal, guests will use these favors time and again, even after the wedding or anniversary celebration has ended. Are these sturdy? I didn't really see any reviews, but saw a review on another site that said theirs broke. Just wondering if these are strong metal? Hello! I am wondering if the personalization tag options can have the color changed on the design itself? Yes, you can choose to change the color of the tag and the text. You'll see that option after adding it in your shopping cart. Hi. For this bottle opener favor, do we get to choose the color of string or ribbon? Where is it attached? Unfortunately, the Love Antique Gold Bottle Opener can't be personalized. This includes a decorative burlap-backed gift tag with delicate doily design and "Love" printed in white. 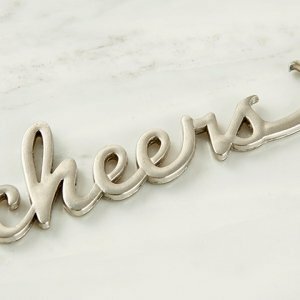 Is this Cheers Silver Bottle Opener a matte finish? It is a matte finish, so it's not completely glossy. We do have other glossy/shiny options, so please do look around.